As you know, farmers are never happy, so forgive us for wanting just a smidgen of rain as we’ve had precious little since the second week of June. It’s also been blisteringly hot for long periods and, as few people realise, us Appellation Contrôlée vignerons are not allowed to irrigate our crops. Still, other than the younger vines on drier soils, the rows look remarkably green and lush here, so we remain positive for the Autumn harvest. 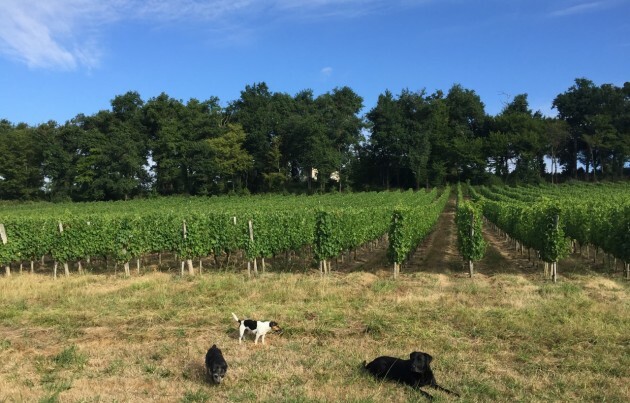 Note that these figures are local (20 kms SE of the city) and may not be the same for all Bordeaux regions, although it’s a similar story elsewhere – the last six weeks have been dry and hot everywhere in Bordeaux. 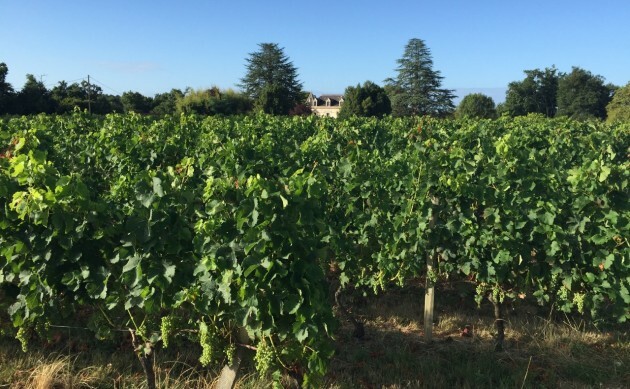 Other areas, such as Margaux, Léognan, St-Emilion and Blaye, have also had half the normal rainfall since the beginning of April, or even less. The Northern Médoc has seen more rain than us, and that was in April, May and early June. I’ll publish the stats from other areas shortly. The drought has blocked the development of the vines and slowed down the ripening of the bunches. We need some rain – not for too long, mind. Just a good, timely dousing, then a return to some sun. In fact, even if we could ship enough water, and had the right logistics in place, we are not allowed to irrigate the vines under French Appellation rules; except to nourish the baby ones that is, as they are not yet in production. Based on the reaction of numerous visitors I talk to, most people have no idea that growers and chateaux in Bordeaux are not allowed to water their vines. I should point out that this rule in France applies to growers who make Appellation Contrôlée or Appellation d’Origine Protégée wines, as in Bordeaux. It’s all about the terroir and typicité, you see. A wine should be true to the land, the climate, the vintage and all that. 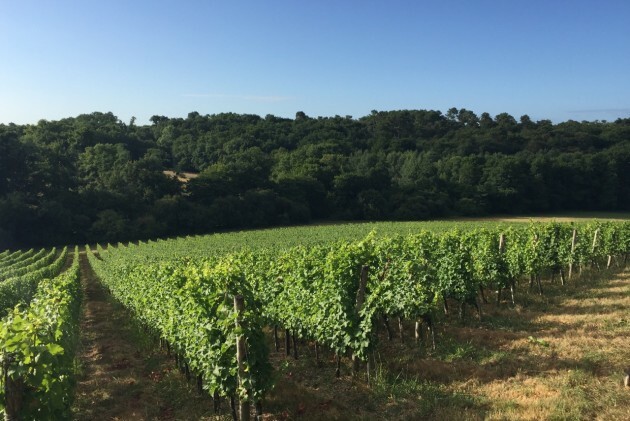 A cynic might think that it has more to do with controlling the amount of wine that the market can stand – 98% of the Bordeaux region, the Gironde, is Appellation Contrôlée – but let’s not go there for the mo. Producers who make Vins de Pays and Vins de France (the smarter new name for Vins de Table), on the other hand, are allowed to irrigate. The yields can be much higher with these wines as a result and that’s one reason why they can be cheaper. When we drove down to the Gers and Vins de Pays de Gascogne territory to spend the night with friends the other day, I felt envious of the irrigation systems in some of the vineyards, in and around the rolling fields of beautiful sunflowers. 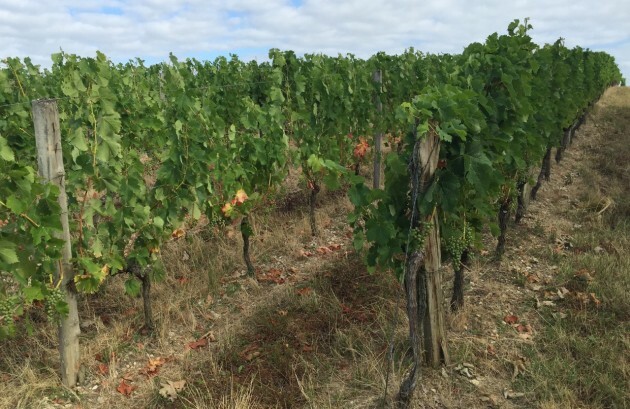 All these photographs were taken on 28 July 2015 at Bauduc and it’s remarkable how healthy the vines appear, not least when seen against the dried-out and straw-coloured grass. 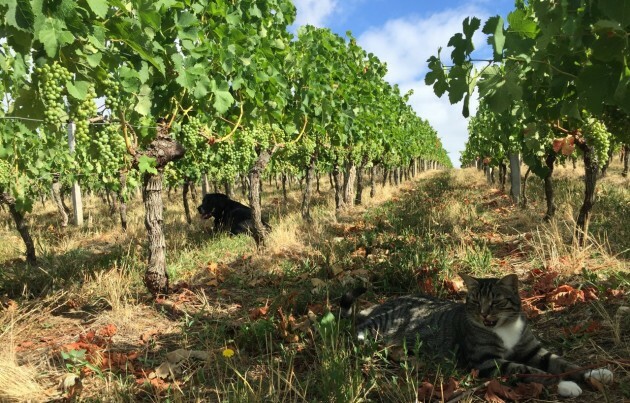 The vines that really do need irrigating though are the young ones on the more gravelly soils, like the row on the left below. Note how the leaves are wilting and turning brown and yellow, compared to the slightly older row on the right. I always enjoy reading your blog even if I do not always leave a comment. Let's hope for the necessary rain and that 2015 will be a great vintage. Hope for the rain! I noticed how the leaves are wilting and turning brown and yellow as well, compared to the slightly older row on the right – it is interesting to see how it changes the color!